I am always up for trying a good cleanser, but finding a good one is that hard bit! Cleansers as stated in the word are used to clean your face, and prepare it for the rest of your skincare routine. This can be one of the most relaxing parts which some people tend to spend the most time on. Cleansers can also come in many different forms and textures, from liquid to clay, gel to foam. 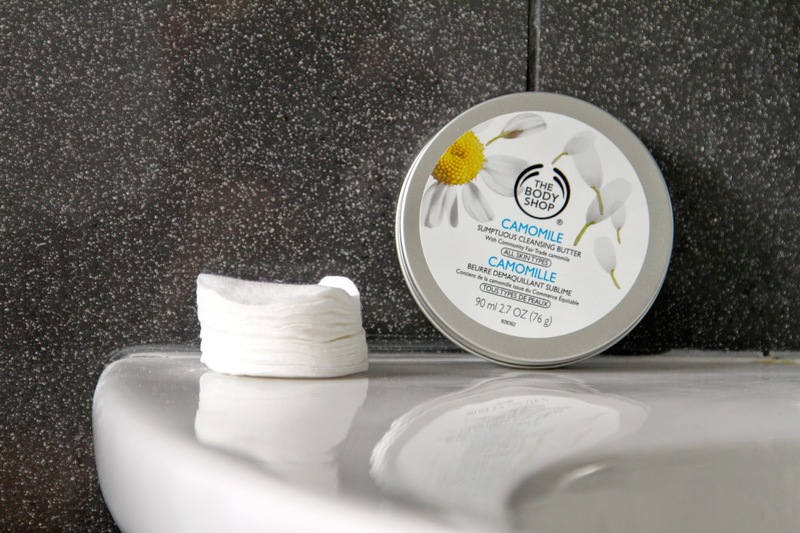 There are hundreds, but after reading different posts from different bloggers, one stood out to me called The Body Shop Camomile Cleansing Butter. I’ve used other products from the camomile range in The Body Shop but never tried this one, nor a balm cleanser. Designed to remove dirt, makeup and relax the face, this cleaner also remains suitable for people with sensitive skin. The packaging is also very lovely with its tin circular case. Once I opened it, you could smell the subtle scent of camomile instantly, but when using my finger to scoop a little into the palm of my hand, it felt very greasy. Now I tend to stay away from greasy products on my face as I have combination skin and can be quite greasy at times, especially in the hot weather! However I proceeded to carry on the process and started to gently massage the balm into my face. I then removed the balm with hot water and dried my face off. This cleanser I feel would be suitable for people with dry skin as it has a very greasy texture so it would hydrate the skin whilst cleansing. I wouldn’t recommend this to anyone who has greasy skin already as it would defeat the objective. However this is a really nice product from The Body Shop but a 5/10 for me! Let me know what you think about this cleanser! Did you have the same experiences?